Firma Melodiya and the Andrei Konchalovsky Foundation present a unique set dedicated to the outstanding Russian pianist of the 20th century Vladimir Sofronitsky. Sofronitsky who tolerated no clichés strongly objected to the reputation of a Scriabinist although he found his own inimitable key to Scriabins music at an early age. Those who had a chance to hear the composer play said that only Sofronitsky was congenial to Scriabins interpretations. With a hostile attitude to studio work, the pianist felt truly free only in concert. He was able to perform the same piece differently even just a few days later. Every time Sofronitsky played, he re-experienced music, let it through himself as if he confessed before the audience. Perhaps that was the main secret of his magical impact. Many of the remaining concert recordings still preserve that sensation. 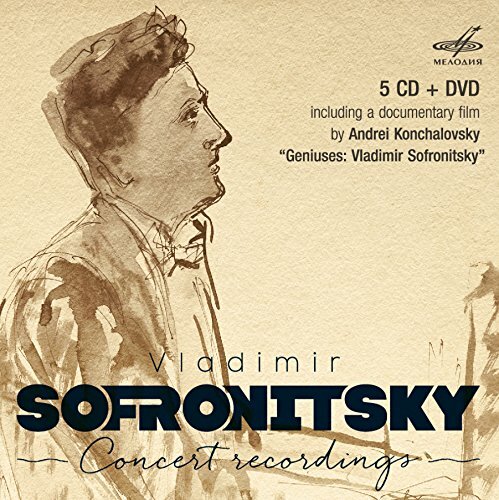 Five of six discs include recordings made at Vladimir Sofronitskys recitals in 1951 to 1960, including works of Scriabin, Schumann, Chopin, Schubert, Liszt, Mozart, Rachmaninoff, Lyadov, Debussy, Prokofiev and Shostakovich. The sixth disc of the set includes a documentary on Vladimir Sofronitsky filmed by the outstanding contemporary director Andrei Konchalovsky. If you have any questions about this product by Melodiya, contact us by completing and submitting the form below. If you are looking for a specif part number, please include it with your message.